Twenty plus years into their career, Soulfly are still and explosive prospect. “Ritual” is the band’s eleventh album, and by harnessing all the meaty groove metal trappings you crave, is also perhaps the finest post Sepultura Cavalera effort of them all. There's much Sepultura familiarity here; the title number is basically Ratamahatta rewired and vehemently injected with modern thrash venom. Cavalera is having other sly dig through past glories, perhaps most notably on “Dead Behind The Eyes”, whose riff resembles that of From The Past Comes The Storm, but there’s also enough stuff on here to suggest his penetrating gaze is stuck towards future. Time, it seems, has only strengthened his resolve, as we find cuts like “the Summoning” and the scorching “Evil Empowered” channelling his characteristically impassioned resolve. 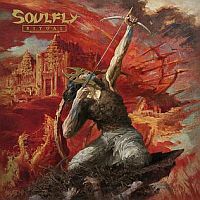 Exploding into life with a thundering riff, “Under Rapture” (featuring Immolation’s Ross Dolan) and replete with killer rhythmic twists, is arguably one of the best things Soulfly ever put on record. Similarly impressive is the crunch’n’groove anthem “Blood on the Street”, and the album climaxes, almost literally, with “Bite the Bullet”, a libidinous chunk of groove metal with all that magnificent tribal swagger.